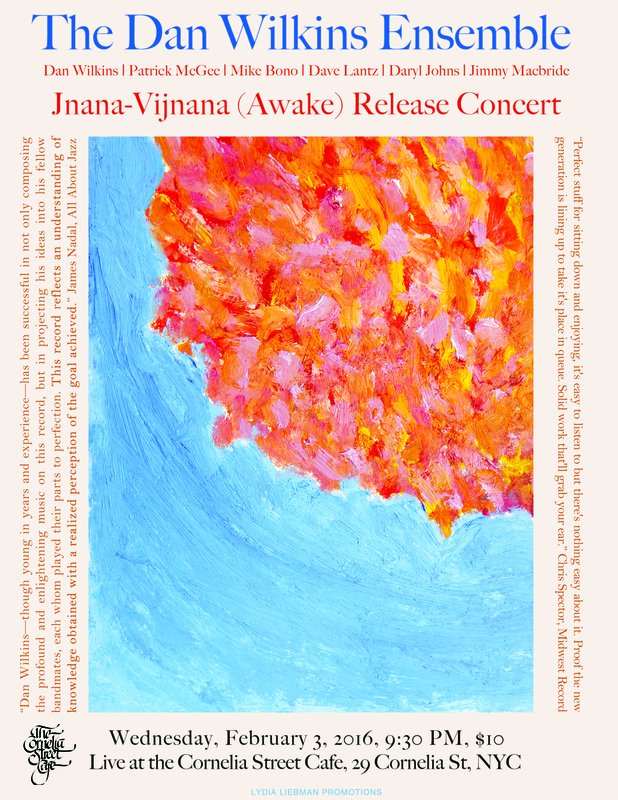 The Cornelia Street Café is proud to present the Dan Wilkins Ensemble Jnana-Vijnana (Awake) Release Concert on Wednesday, February 3, at 9:30 PM. The Cornelia Street Café is located at 29 Cornelia Street in the West Village neighborhood of New York City. The cover charge is $10 with a $10 minimum. More information can be found by visitingwww.corneliastreetcafe.com. Saxophonist and composer Dan Wilkins is a graduate of Manhattan School of Music’s prestigious jazz program and has studied with some of the foremost educators in jazz including NEA Jazz Master Dave Liebman, Caris Visentin-Liebman, Phil Markowitz, Steve Wilson, Rich Perry and Garry Dial. He has performed throughout the United Sates as well as internationally. The Dan Wilkins Ensemble is comprised by some of New York’s most sought after up and coming musicians including saxophonists Wilkins and Patrick McGee, guitarist Mike Bono, pianist Dave Lantz, bassist Daryl Johns and drummer Jimmy Macbride. Members of the ensemble have performed with jazz luminaries such as Wynton Marsalis, Kenny Barron, Dave Liebman, Terence Blanchard, and others. The ensemble looks to pain imaginative and visceral sonic landscapes, exploring harmonic layering in support of dynamic, lyrical melodies and rhythmic hooks. These pursuits are colorfully illustrated on Jnana-Vijnana (Awake), the ensemble’s explorative debut inspired by personal psychological and spiritual experiences including one with self-realization guru Pujyashree Deepakbhai.